St. Tropez natives and luxury villa rental vacationers alike look forward to new and improved editions to one of the world’s most exclusive shopping districts. St. Tropez is famous for many things–yachts and luxury villa rentals, glitzy late night parties and celeb spotting–and it’s no surprise with the calibre of vacationers the village draws that one of the things it is most known for is great shopping. High-end shopping. In anticipation of this year’s high season of July and August, many designers are opening and revamping stores in the chic resort town. The Italian luxury brand founded and run by the elegant Diego Della Valle has been having a banner year. Not only did they recently announce a great coup–namely signing Karl Lagerfeld to design a special collection for their Hogan brand, which was started by Diego’s son Emanuele–but they are also redesigning all of their flagship stores. From Beverly Hills to St. Tropez, the new Tod’s stores have been unveiled one by one to reveal interiors meant to evoke the feel of a friend’s home–albeit a very stylish friend. Every store features different furniture and art, and are made up in warm colours and luxurious fabrics, so as to make the customer feel like they have just passed the threshold of one of the inviting and impeccable luxury villa rentals that dot the area around town. The St. Tropez store features rich woods and chairs done in deep blue velvet and yellow leather with chic nailhead detail. It seems clear that the darker, richer furnishings and Tod’s new “Home Concept” have been inspired by the classic and luxe designs of Derek Lam, the brand’s creative director for ready-to-wear and accessories. The luxury brand also recently renovated their St. Tropez boutique and celebrated with a glittering party and a special edition Neverfull beach bag. Only 500 of these limited edition monogrammed “St. Tropez” GMs were produced and they were only sold out of the new St. Tropez store. The renovation means an expanded retail space in a gorgeous villa with sleek interiors filled with blond wood, lavish beige furniture, and framed black and white photographs. One of the most beautiful elements of the store is it’s charming Provençal-style garden courtyard, which makes you feel like you’re in an authentic St. Tropez luxury villa rental rather than a bastion of commercial excess. In celebration of the event, LVMH has also commissioned graffiti artist André to produce limited edition drawings, some of which will be available for sale at the store. 2010 is the year of Karl Lagerfeld in St. Tropez as the French resort town seems to be the venerable designer’s current amour. Not only did Lagerfeld hold the Chanel Resort collection runaway show in St. Tropez, but the company also produced a star-studded ad campaign here and held a glittering fête to celebrate. 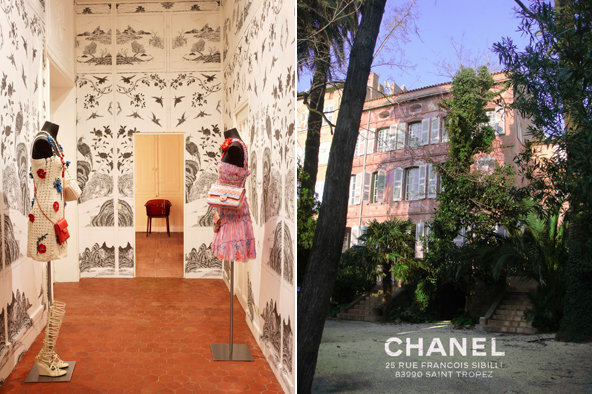 To cap off the St. Tropez obsession, Chanel recently opened a seasonal “pop-up” store in an 18th century mansion located near the Place de Lices. Decorated in very Chanel black and white, as well as chic reds and beige, the store also boasts stencilled walls, a gorgeous garden and, of course, racks and racks of gorgeous clothing items. The only downside is that the pieces are all from the house’s fall ready-to-wear collection and, while it may seem a little incongruous shopping for tweed while wearing a floaty caftan, it is Chanel after all and there really is no wrong time to snap up some interlocking Cs. Some of these pieces are bound to end up in the closets of those staying in luxury villa rentals in St. Tropez in 2010. Chanel, 25 rue François Sibilli, St. Tropez (Open from June 23 to October 3, 2010). On the heels of the Chanel pop-up store comes news that Lanvin is following suit. Of course, pop-ups may be the wrong word here. These are not exactly hastily thrown together retail outlets, but true lessons in glamorous luxury. Now, only a short walk from the beach, you can flip through Alber Elbaz-designed summer and pre-fall pieces and revel in the feminine whimsy of the boutique’s design. Like the Chanel store nearby, and the many sun worshippers coming in to vacation in St. Tropez luxury villa rentals, the Lanvin boutique will disappear come October. So, darlings, where will you be laying down the Black AMEX this summer? This entry was posted on Wednesday, July 14th, 2010 at 11:18 am	and is filed under Saint-Tropez, Shopping. You can follow any responses to this entry through the RSS 2.0 feed. You can leave a response, or trackback from your own site.